We all know the friendly neighborhood Spiderman, but what do we really know about him. Unlike its Tobey Maguire predecessor, The Amazing Spiderman remains much truer to comics by presenting us with a highly intelligent, wisecracking hero. The Amazing Spiderman 2 seeks to continue this trend by not only exploring the skeletons in Spidey’s closet, but also by showing the most tragic moment in his life. As we learned in the post credits of the first Amazing Spiderman movie, there are some dark secrets in Peter Parker’s family history. There were plenty of alternative stories about Peter’s parents from died in plane crash to were spies. Judging from the sequel trailers, it seems as though the secret is that Peter’s father was connected to Oscorp and might have even tried to stop them. While in conversation with Harry Osborn, it seems as though Peter has been under surveillance for quite a while, which means they most likely know about his alternate life as Spiderman – as well as all his weaknesses. The Superbowl trailer gave us a huge look into the character of Electro aka Max Dillon – played by Jamie Foxx – who for all intensive purposes is crazy fan turned villain over unrequited affection. We see Spiderman save this unnoticed Oscorp worker and make him feel important – as any good hero would do – but Max takes it a little too far. Hero worship is always understandable, but a Spiderman shrine is a bit much. While at work in some sort of Oscorp power plant, he falls into a tank of eels and electrical wires and basically becomes Electro – I’m sure the science will be worked out later. After meeting Spiderman in Time Square and him not being remembered, Electro freaks out and attacks Spiderman. I’m Blue Da Ba Dee Da Ba Die … sorry, couldn’t resist. Whether Spidey drops the ball or Electro is just that unreasonable remains to be seen, but one way or another Spiderman is in for the fight of his life. It seems as though Spiderman and Electro eventually fight in some sort of power plant, and if this is the same one that Max worked in that’ll certainly give him home field advantage. Sadly, Spiderman has a lot more than just one crazy fan with an electric personality. One tremendous story arch in the comics revolved around the death of Peter Parker’s first love – Gwen. 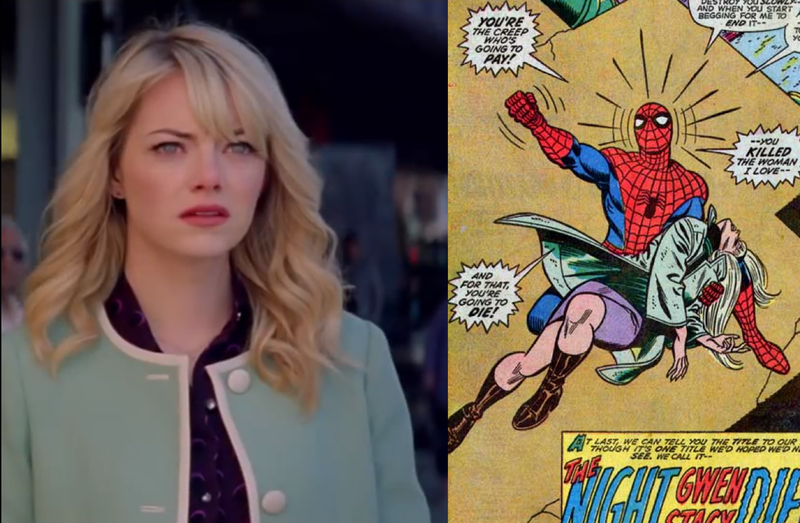 In the comics, the Green Goblin throws Gwen off a bridge and as Spiderman tries to save her inadvertently snaps her neck. It’s a horribly painful moment in the comics and it seems as though Gwen’s death will be coming in this movie in some way, shape, or form. One of Gwen’s outfits for the film looks strikingly familiar to the one she wore when she died in the comics. With the trailer also focusing heavily on hero’s paying the price for being heroes, something dreadfully painful is certainly on the way for young Peter Parker. One of the many problems of Spiderman 3 – besides the painful-to-watch strut scene – was how it incorporated too many villains for no reason other than to have them. Unlike other films such as the Dark Knight trilogy where the villains have a connected story, there was nothing linking them together besides “hey, we all apparently don’t like Spiderman”. Thus far The Amazing Spiderman 2 has three confirmed villains, but while watching the trailer it seems as though more might be on the way. During the trailer we can clearly see displays set up for a flight system as well as mechanical arms. These are most certainly for the villains Vulture and Doctor Octopus, but are they in the movie? Vulture’s wings (left) and doctor Octopus’ arms (right) can clearly be seen in this scene from the trailer. There’s a lot of the Spiderman universe that is fair game for the films. For example, Mary Jane was set to be cast for this film, but her appearance was pushed back to The Amazing Spiderman 3 due to this film already seeming crowded. Despite these possibilities and staples, what will the movie itself directly lead to? As I mentioned before, perhaps the Vulture and Doctor Octopus armor is a part of the post-credit scenes, but with the shadowy figure not stopping at either, one has to wonder where he’s walking. The answer might have been revealed in another scene in the movie. 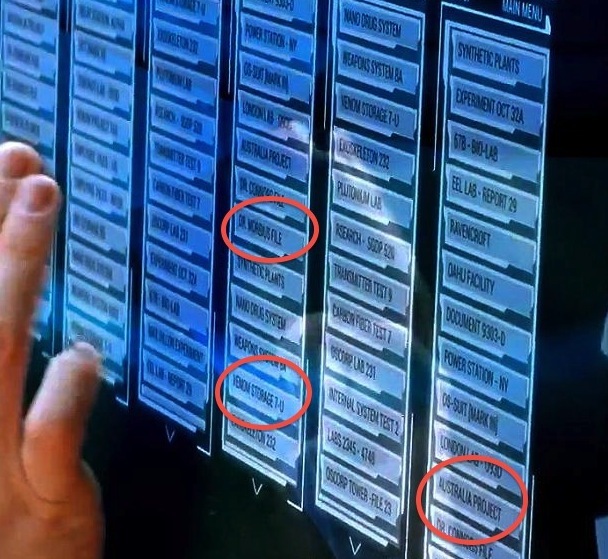 While Harry Osborne is showing Peter that he has been under surveillance, you can see a lot of Oscorp’s other private files – 3 of which are particularly interesting. The first is something titled “Project Australia”, which could possibly tie into a character known as ‘Kraven the Hunter’, a Russian big-game hunter who has been amplified with various animal abilities. The second I could be misreading, but it seem to say “Dr. Morbius Files”. Much like Dr Connors – aka ‘The Lizard’ who is also listed in this database – Dr Morbius tried to cure himself of one disease by gene splicing but instead became a monster, an actual vampire in this case. In the comics he was defeated when Spiderman and The Lizard joined forces so perhaps Rhys Ifans will even be reprising his role for The Amazing Spiderman 3. The final possible reveal in this scene is entitled “Venom Storage 7-U”. Venom was a symbiote of mysterious origins that could bond to a human host and make them exceptionally stronger – but eventually take them over. If this movie does end in Gwen’s death, it will leave a much more grief-stricken – possibly rage-filled Peter Parker – which could tie into Venom taking over. Oh . . . and just who are you sunshine? Could it be Norman Osborn? But he seems less spry than in the post credits of the first film. One way or another this movie is definitely has a lot of ground to cover. All we can do now is hope that it does so nicely. Maybe Electro is the small intro villain like Scarecrow was in Batman Begins, and then steps aside to reveal The green Goblin. I enjoy Andrew Garfield’s Spiderman so hopefully this film can continue what the first one started.